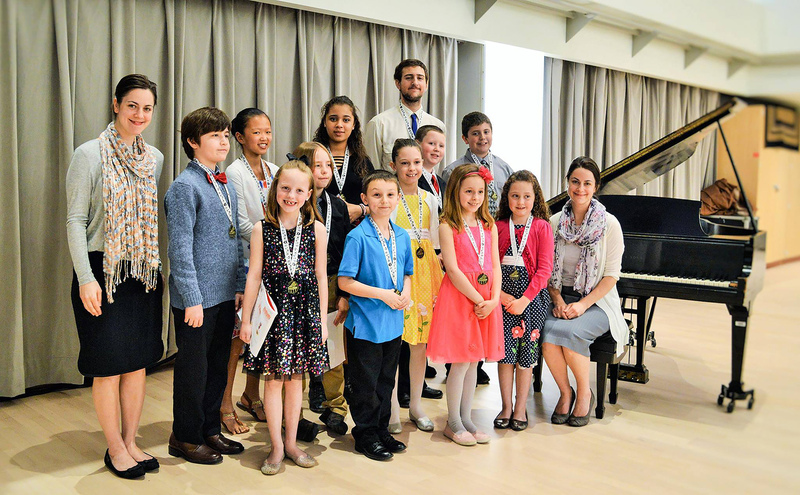 Elizabeth and Evangeline Canfield, both SUNY Oswego music faculty members and Oswego Youth Conservatory teachers, have added group piano classes this fall for the very young and the young at heart. Emphasizing fun and familiarity, the Canfields are offering lessons for children ages 4 to 6. Adults can tap their inner musician, too, with a new series of classes. Mihoko Tsutsumi, director of choral activities at the college, also announced that the conservatory's Youth Choir would prepare this fall for its appearance with the College Choir in Oswego Opera's staging of the comic opera "Mikado." The sessions, titled "Choir Boot Camp," are for ages 12 to 18. All piano sessions -- including the existing program for youngsters ages 7 to 17 -- are set to begin the week of Aug. 28 to 31, but the Canfield sisters said participants may sign their children up through the first several weeks. Piano classes will take place in Room 228A of Hewitt Union. Little learners will attend "Music & Me" class 4:30 to 5 p.m. Thursdays. Classes for students ages 7 to 11 start at 4:30 p.m. Mondays, for ages 12 to 17 at 4:30 p.m. Wednesdays. Then there are the new classes for adults up to any age, from 6 to 7 p.m. Monday. "We are frequently out and about in the community, we play concerts and people over and over say, 'I always wanted the play,'" said Evangeline Canfield. Her twin and co-teacher, Elizabeth, added, "Even though it's the Youth Conservatory, we said, 'Why don't we just make it Young at Heart.'" The Canfields, who grew up in Fulton and received bachelor's degrees in music from SUNY Oswego and master's degrees in piano performance from Bowling Green, said the group lessons for any age are at one's own pace and don't require prior musical training. "The new classes for young children will have great fun with their exposure to music. We'll use games and stuffed animals and learn age-appropriate songs," said Elizabeth. "We want them to leave with a love of music, in general," Evangeline said. "In particular, we want them to take away that spark of learning to stay with piano in their lives." Adults, often pressed for time, will find time to practice as they can, but would benefit from group support during class, the Canfields said. "You see you're not the only one -- there's a sense of community," said Elizabeth. Sessions of "Choir Boot Camp" will take place from 4 to 5:30 p.m. Tuesdays and Thursdays in Room 50 of Tyler Hall. Cost for the classes are $196 per student ($14 per session) and is payable in installments. Added sibling and friend discounts are also available. Thanks to a grant from the Shineman Foundation, scholarships are available for new students whose families have need. For registration or more information, visit oswego.edu/youth-conservatory or contact Pamela Lavallee at pamela.lavallee@oswego.edu or 315-245-7087. Piano for all -- SUNY Oswego music faculty members Evangeline (left) and Elizabeth Canfield (right) will team again to teach Oswego Youth Conservatory group piano for ages 7 to 17, but have added new classes for children ages 4 to 6 and for adults up to any age.